Masuri is the brand choice of the professional cricketer. 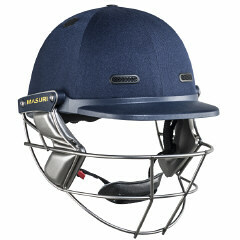 Vision Series Test is one of the helmets in the latest range from Masuri featuring superior air flow ventilation. The Vision Series Test is built for a high level of impact, protection and comfort. Strategically-placed vents in the inner and outer shells improve air flow, and the new reinforced rim (HRS) minimises movement between the solid peak and the certified steel or titanium bar grille, giving the Vision Series Test strong protection performance. Available in Navy Blue, Bottle Green, Maroon or Black and fitted with Titanium Visor.